North Korea Says It Tested An Engine For An Intercontinental Ballistic Missile : The Two-Way It's not possible to verify the claim, which follows a series of weapons tests from the isolated nation. North Korea says this engine would boost its ability to launch a nuclear attack on the U.S.
South Korean people watch a television broadcast at the Seoul Railway Station earlier this month reporting North Korea's surface-to-air missile launch. North Korea claims that it has conducted a successful test of an engine for an intercontinental ballistic missile, which it says would boost its ability to carry out a nuclear attack on the U.S. It's not possible to verify the claim, which follows a series of weapons tests from the isolated nation. Reuters reports that North Korea's state news agency quoted leader Kim Jong Un, who it says supervised the engine test: "Dear Comrade Kim Jong Un said now we can mount an ever more powerful nuclear warhead on a new intercontinental ballistic rocket and put the den of evil in the United States, and all over the world, within our strike range." According to Steve Evans of the BBC in Seoul, "Step by step, North Korea is completing the tasks needed to have a nuclear-tipped missile capable of striking the US." At the same time, there's good reason to be skeptical of the country's claims about its capabilities. Reuters says both South Korea and the U.S. have "shown scepticism over the North's statements about rapid progress in its nuclear and missile programmes." In March, North Korea released photos showing Kim Jong Un standing with a purported miniature nuclear warhead that could fit on an intercontinental ballistic missile. 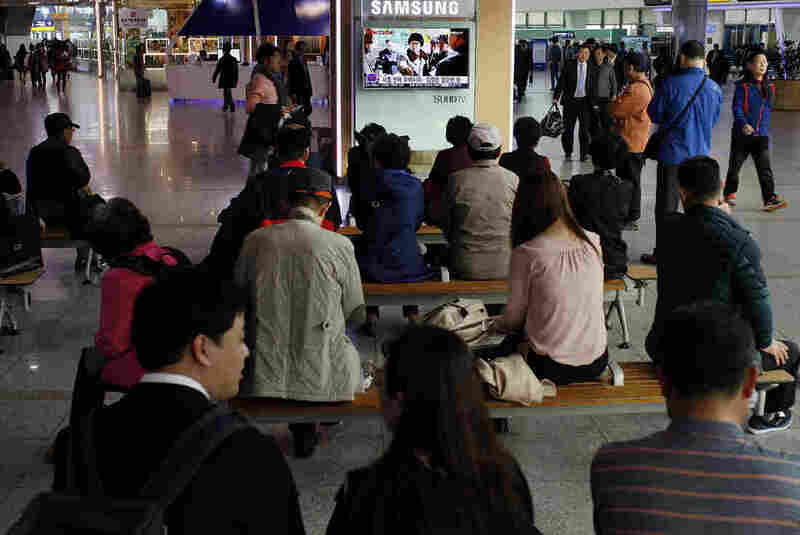 A South Korean army soldier walks by a TV screen in March showing North Korean leader Kim Jong Un with superimposed letters that read: "North Korea's nuclear warhead." 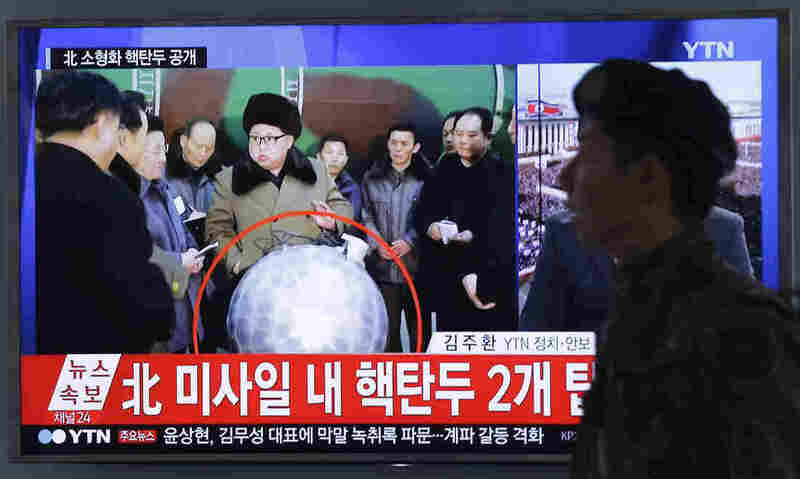 As NPR's Geoff Brumfiel reported, it wasn't really a nuke — but the photos still startled analysts: "The ball on the table was obviously a model, but many of the details were reasonably close to a real miniaturized warhead." In January, North Korea conducted its fourth nuclear test in a decade. The U.N. Security Council then voted to impose a raft of new sanctions against North Korea in March, "meant to persuade the country to stop testing nuclear and missile technology and return to negotiations," as NPR reported. But so far, the isolated nation has not responded to the pressure. North Korea is set to hold a party congress in May. NPR's Elise Hu reported the major strategy meeting is the first such gathering since 1980. "The congress is expected to roll out the next phase of Kim's rule," Elise wrote then. And South Korean Unification Ministry spokesman Jeong Joon-Hee told Elise that "in advance of that event, South Korea is bracing for additional surprises, and perhaps even an additional nuclear test."